Floods Scrutiny: Canvey Island the Special Case, complacency, and the Pitt Review, lessons Not Learned! Flooding came under the focus last night at the Castle Point Scrutiny meeting set up to consider the July 2014 rain storm. The second meeting gave residents the opportunity to inform the committee the problems they faced and their issues in the aftermath. Residents gave heartfelt and harrowing accounts of losses and damage to belongings and property. Accounts of residents’ first contact with Insurance companies on the whole appeared reasonably positive, however we also heard from residents that future flood insurance cover may be declined, premiums would rise dramatically or the excess sum on future claims would be prohibitive. Castle Point Council must shoulder some blame for the flooding. They have responsibilities to ensure that housing development was proportionate to the drainage system capacity. There was an extraordinary amount of rainfall that fell on the day of the flooding, as did just 11 months earlier in August 2013, however the complex nature of the Island’s drainage system should have rung alarm bells earlier. Whilst we have been reassured of the pumping capacity the neglect of the maintenance of the drainage system should have been challenged long ago. Flood events do not occur on calm days. Whether during heavy rainfall, or stormy weather the likelihood of debris finding its way into the drainage system is highly probable. The cost cutting by our Flood Authority, Essex County Council, has meant gulleys have not received an adequate clearing regime. Over development has seen the loss of green fields. These green fields were supposed to alleviate flooding. Canvey Island is at or below sea level with a high water table, however being generally flat this will allow water to disperse over a great area. With the continued high density development approved by Castle Point Council the value of this safeguard is now questionable. The Environment Agency were cautious towards allowing development on Canvey Island until they were convinced that Canvey was a “special case” and were persuaded to allow CPBC take responsibility for housing development matters despite being a Flood Risk Zone. The new Local Plan indicates an intention to develop 1,450 more properties in the next 20 years. Previously, CPBC allowed the belief that the Environment Agency had imposed a moratorium on housing development at Canvey Island, whilst this was disproved there can be no doubt that a moratorium should be in place while this whole debacle is sorted out. ECC have applied for £115,000 grant towards their responsibilities to prevent flooding on Canvey. Be assured this will go nowhere near addressing the inherent problems facing the drainage system. The Environment Agency have responded to one of the Canvey Green Belt Campaign group enquiries. We were concerned that applications for two block of flats, one in a area affected by the recent flood, received no comment by the EA on the subject of potential surface water flooding. “ The reason why we have not referred to surface water for the 2 examples you have provided (Flats at Canvey High Street and Leige Avenue) is not to do with their location on Canvey Island, but because both these sites are well under one hectare in size. Clearly the responsibility falls squarely on CPBC and the Development Committee’s shoulders whether these proposals were suitable. And yet hardly a word on surface water issues was included in the officer’s guidance notes. Housing development built since 2009 will not be included in the Insurance flood guarantee scheme being draw up between the Government and the Insurance industry. And yet this is not a reason for refusal for housing development. Once again the Canvey Green Belt Campaign group have made enquiries directly to the Association of British Insurers. “Flood Re will exclude developments since 2009 – just as the Statement of Principles did. This is because we do not want Flood Re to become an incentive for inappropriate development in areas at risk of flooding.” Aidan Kerr ABI Head of Property. Castle Point Council have commissioned and adopted a Surface Water Management Plan document to use as evidence towards the new Local Plan. The “local knowledge” informed Scott Wilson that there was literally but one or two records of historic events of surface water flooding on Canvey Island. The reason for this was not that there had been no previous flooding but that CPBC had failed to keep proper records as was their responsibility. This responsibility now falling upon Essex County Council as the lead Flood Authority. The final misleading document, being adopted by Castle Point Cabinet during 2012 as it gave the green light to the amount of housing development on the Island that they desired. The next Scrutiny meeting, date to be announced will see the various Agencies involved hopefully give some explanation as to what plans are now in place to prevent future flooding of properties following rainstorm. In the meantime cllr Howard told the scrutiny committee and residents that “things are progressing” in the background with an imminent announcement due. The involvement of the Government Scientist, at MP Rebecca Harris’ request, is paramount. He / she must be made aware of previous “local issues” affecting decision making in the Borough and be free of these influences so as to examine the issues facing the drainage system on Canvey Island. There is a view, which the Canvey Green Belt Campaign group do not disagree with, that the Environment Agency and the Planning Inspectorate have failed Canvey Island residents. Both appear unwilling to take strong decisive action where development in a flood risk area is concerned. Essex County Council and Anglian Water have also hardly covered themselves in glory! It is truly disappointing that the work and effort spent in producing the Pitt Review into the summer floods of 2007 has not seen an effective scheme developed in Castle Point. The simplest unlearned lesson from Pitt: don’t put a sandbag in your doorway. Pitt recommended people to block doorways with a close-fitting flood board instead. But most flood victims haven’t. Did the government fail to get the message across or were homeowners complacent? Historically, there seems to be a cycle of increased spending after a flooding event but it tends to taper off as the flood waters recede. 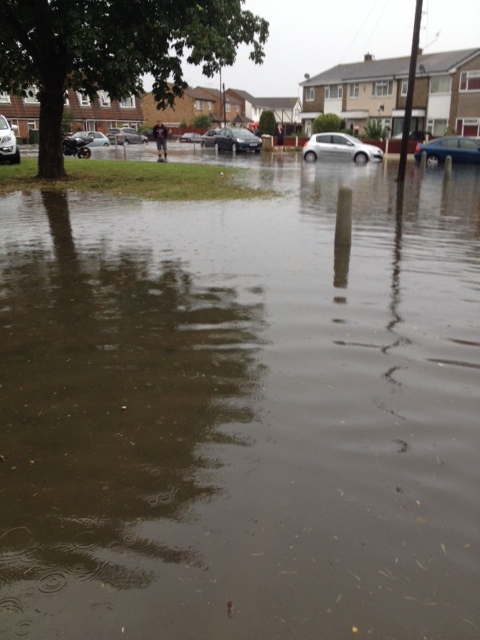 (this is not conducive to a maintenance led policy, which Canvey’s drainage system appears reliant on). Before the floods in 2007, funding had increased to £500m, but was still below the recommended level. In the wake of 2007, there was another surge of spending that brought cash allocated up to a high point of £670m in 2010-11. It has since dipped back below £600m. As well as the amounts, questions have been raised about how the money is now spent. Pitt strongly recommended that people should be stopped from smothering gardens with hard surfaces that create run-off water. Rules have been implemented but enforcement is lax, and gardens are still being paved. (“Unsuitable for Canvey Island” Scott Wilson). Pitt said it was impractical to stop all building on floodplains but advised a strong presumption against it. He insisted that buildings should avoid creating flood problems for themselves or their neighbours. One of Pitt’s successes. The Environment Agency and the Met Office have worked together to produce five-day flood warnings, giving planners an extra 24 hours’ notice of floods. Where the hell was the warning from the EA ahead of the July flood given the advance weather warning? Hopefully all will be revealed at the next CPBC Scrutiny Meeting.